I’m not sure how I could be married to someone for ten years and not know that his favorite dessert is carrot cake! On the other hand, since he seems to like every dessert he is presented with, I’ll just call this his “favorite of the moment.” In any case, it was a special request. 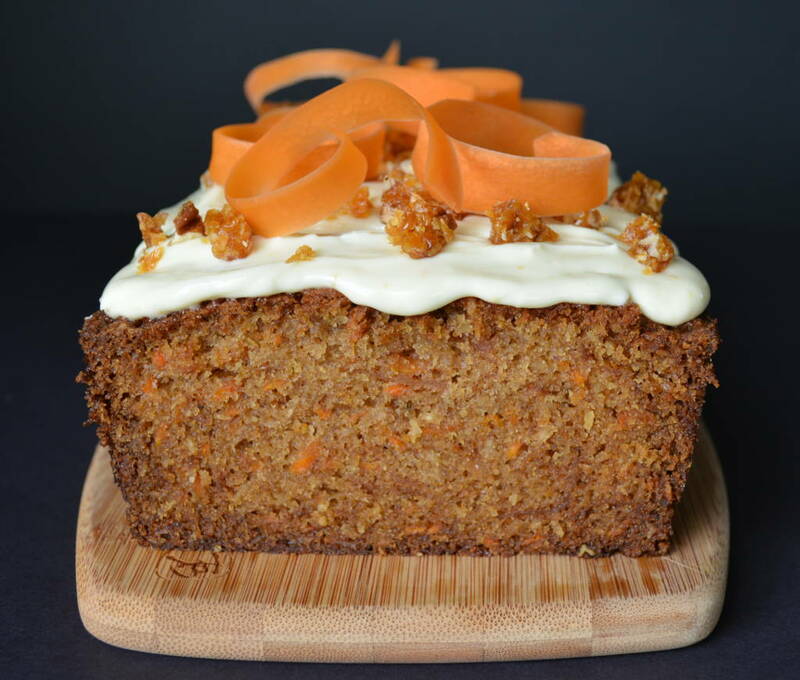 So as not to disappoint, I set out to make a carrot cake that wasn’t like all the others, but was familiar enough to be homey and comforting. 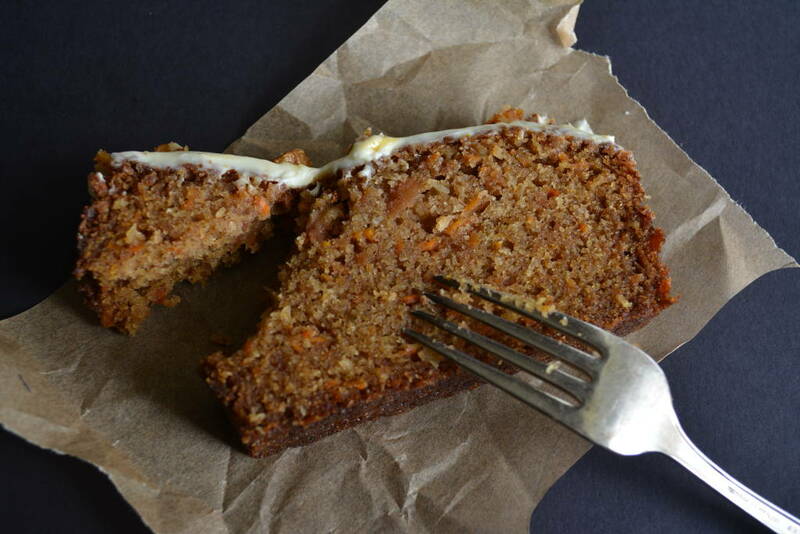 This cake has carrots, of course, some coconut, but no pineapple, raisins or nuts (except as an optional topping). I left nuts out because they often get soggy in a cake. I don’t like that. What I do like is crunchy nuts! The pecan/coconut brittle topping allows me to “eat my cake and have it too.” The brittle does start to dissolve a bit when put on the frosting, though. I recommend adding it at the last minute, or sprinkling on the slices as you serve them—if your cake lasts more than a day—which it may not. 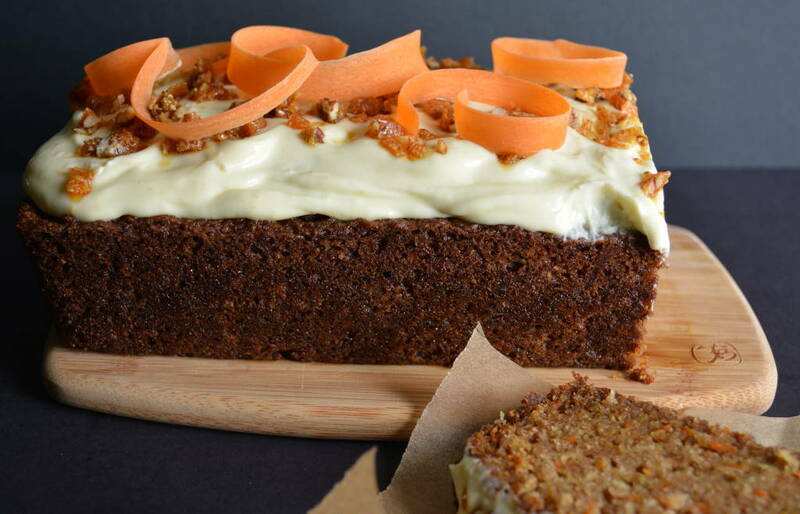 There is orange zest in the cake and frosting, which gives it brightness, and grated apple which adds sweetness and moistness without adding more sugar. I contemplated making a carrot top frosting, but, luckily (maybe) I came to my senses. The frosting is made with a combination of cream cheese and goat cheese, giving it a delightful tang. The goat cheese doesn’t necessarily jump out as an ingredient, but rather as a certain “je ne sais quoi.” It is alluring without being quite recognizable. If you really don’t like goat cheese, leave it out and replace with additional cream cheese. 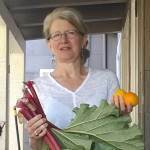 If you love goat cheese, try making it with all goat cheese; that’s what I’m doing next time. 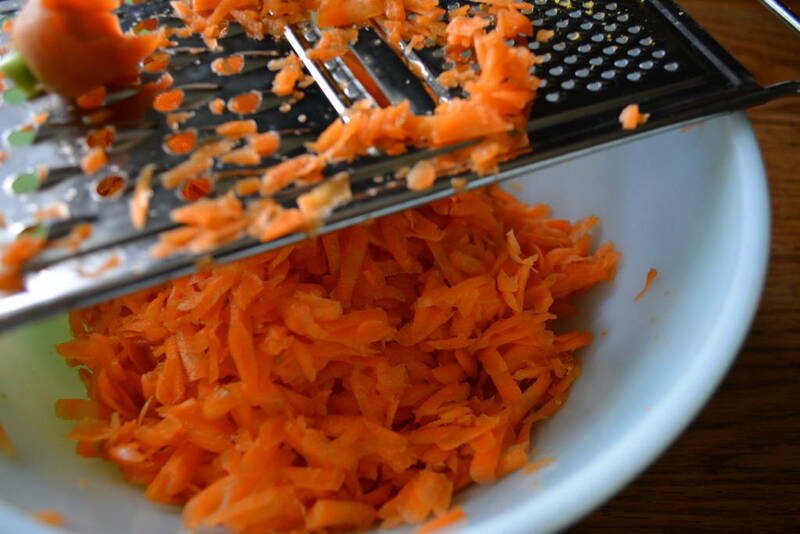 Grate the carrots by hand, or in a food processor. Let the brittle making begin. 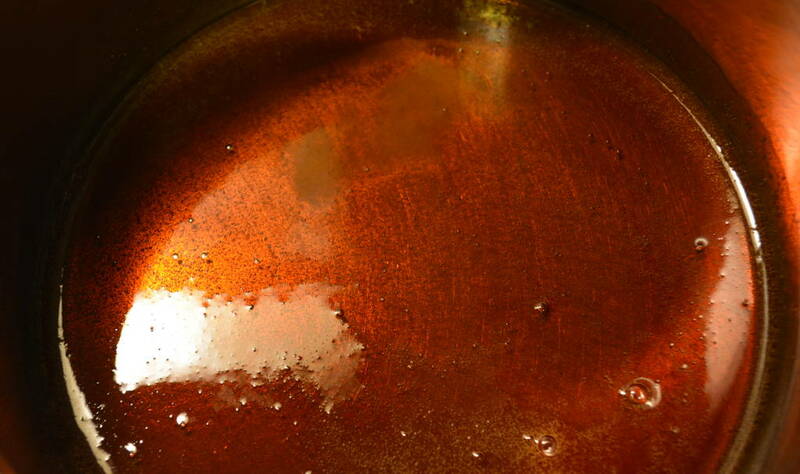 The important thing about caramelizing sugar is to resist the temptation to stir. 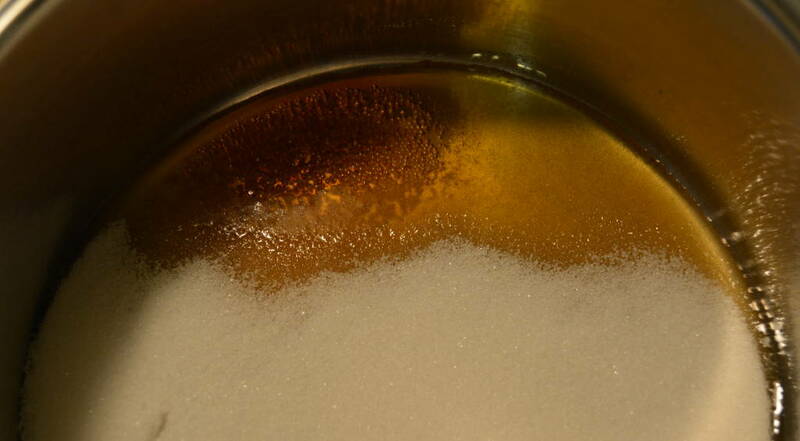 Put the sugar into a saucepan over medium heat. Wait until it starts to melt. If it starts to get very dark in spots swirl the pan gently (you don’t want to get sugar up on the sides of the pan), or gently pull the melted sugar towards the middle of the pan with a wooden spoon. 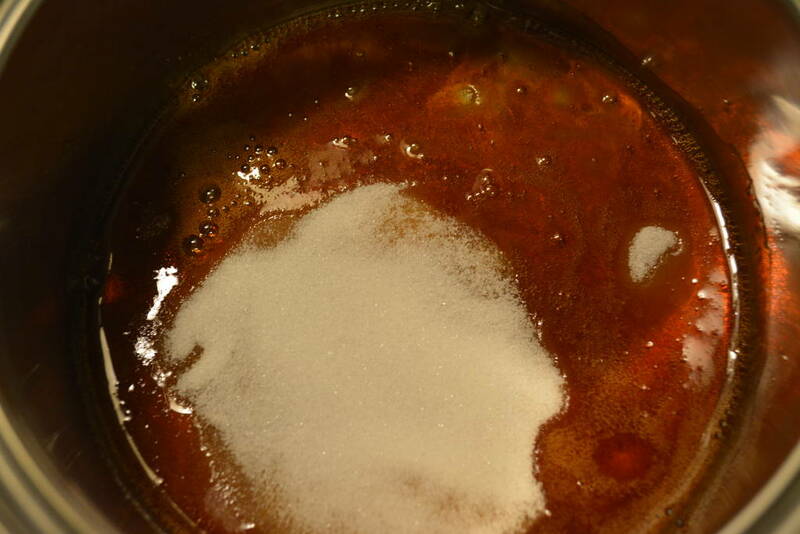 When most of the sugar had dissolved and caramelized, you can stir to encourage the last bits of sugar to melt. It is done when there are no unmelted sugar crystal, and it is a beautiful amber color. Add the toasted, chopped pecans, and the coconut. 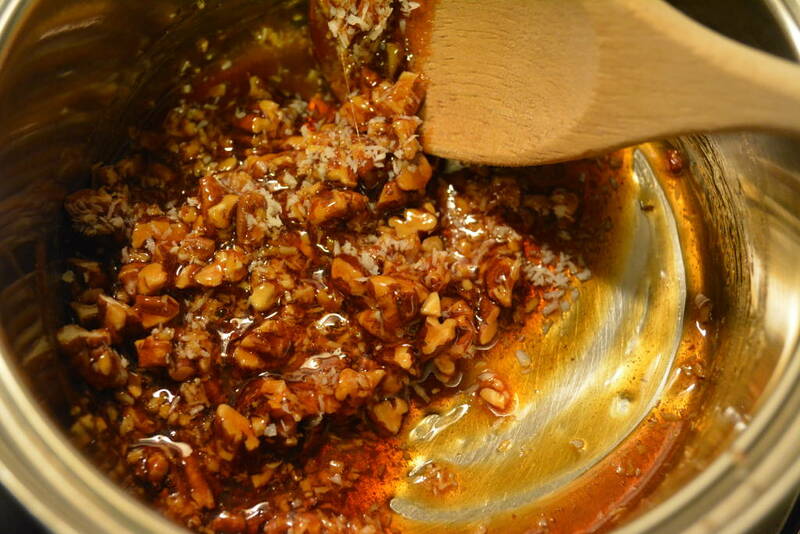 Stir to combine, making sure that all of the nuts and coconut are covered in caramelized sugar. 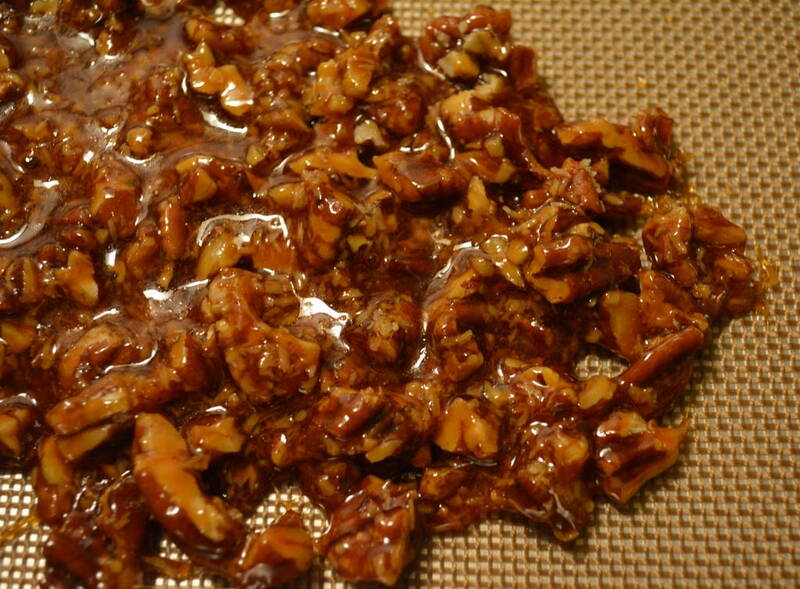 Turn the brittle out onto a non-stick baking mat, or onto an oiled sheet pan. Cool completely. Chop the brittle into small pieces. Sprinkle the brittle over the frosted cake at the last minute. Preheat your oven to 350 degrees F. Butter a 9-by-5-inch loaf pan, and then line the bottom with parchment paper. Stir together the oil, sugar, salt, orange zest, eggs, and vanilla extract until the eggs are fully incorporated into the other ingredients. With a whisk, stir together the flour, baking powder, baking soda, and cinnamon. Make sure that the baking powder and baking soda are evenly distributed. 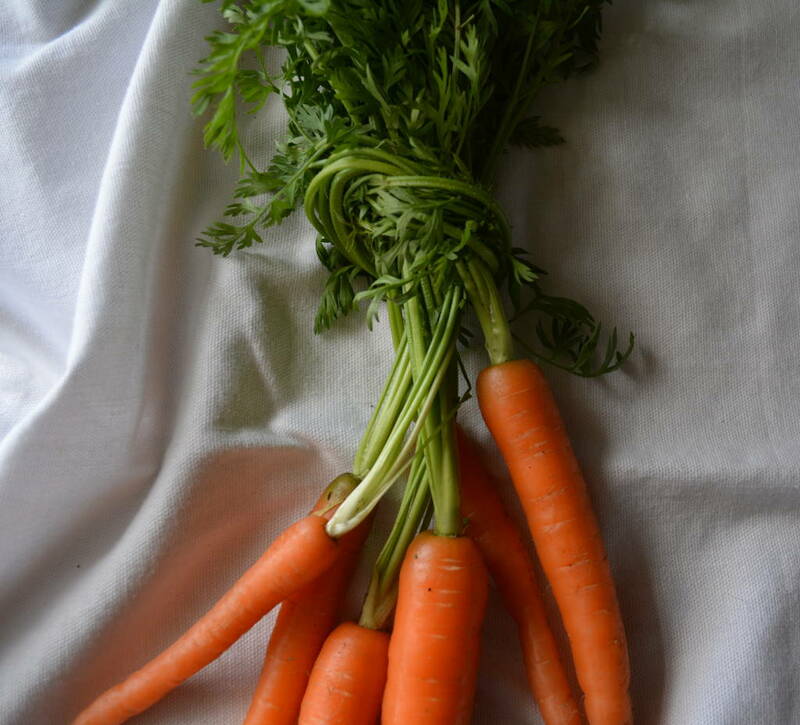 Mix the coconut, carrots, and apple together. Combine the wet and dry ingredients and fold together. Add the coconut, carrot and apple mixture. Stir to combine. Pour the batter into the prepared pan. Bake for about 50 minutes, or until a cake tester plunged into the center of the cake comes out clean. Allow to cool for 15 minutes in the pan. Turn the cake out of the pan, and then place the cake, bottom side down, on a cooling rack. Cool completely before frosting. In a stand mixer fitted with a paddle attachment (or with a hand held mixer) combine the cream cheese, goat cheese and powdered sugar until smooth. Add the orange zest, orange juice, and vanilla extract and mix until fluffy and very smooth. Add more orange juice if necessary. You want a very smooth frosting that spreads over the cake without tearing it, but not so soft that it drips over the sides. 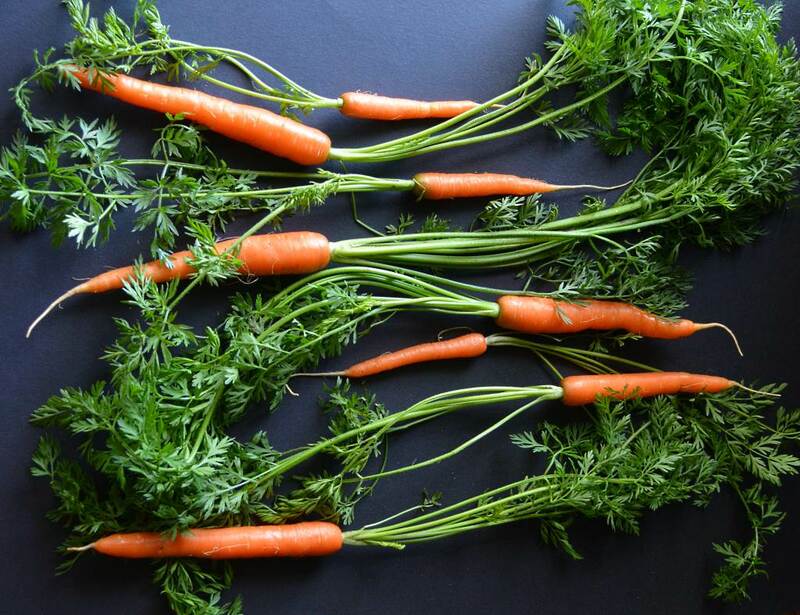 Using a vegetable peeler, peel off long strips of carrot rotating the carrot as you reach the pithy center. Place the strip into a bowl of ice water until they curl slightly. Remove them from the ice water and leave to dry completely on a tea towel. Cover the top of the cooled cake with the frosting. 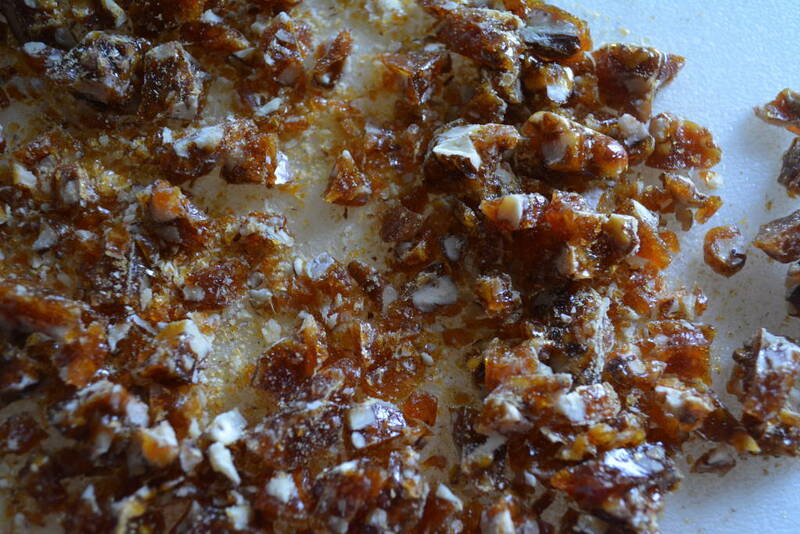 Sprinkle the top with chopped brittle. 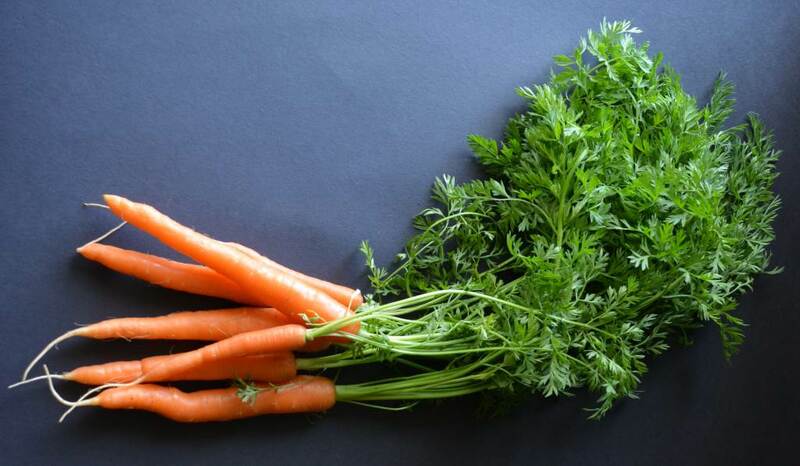 Add carrot curls. 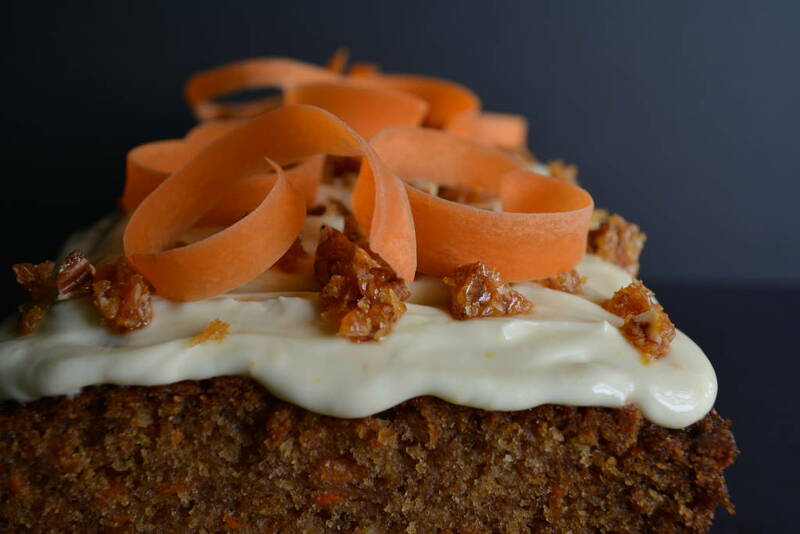 The frosting, brittle, and carrot curls take some additional time, but you can make those elements while the cake is baking.